Visit SuperLenny Live Casino now! SuperLenny Live Casino shows straight away that he loves innovation and would like to surprise you with a refreshing online casino. A classic casino that goes along with modern times is what you will encounter here. The live casino that already has game variants where the game can be viewed from multiple perspectives is a certain plus. Ready for a new adventure? Lenny knows that! SuperLenny once again demonstrates that simplicity creates overview and business character. For others, it is immediately a pleasure to look at the possibilities that SuperLenny Live Casino has to offer. Colourful animations are missing and moving banners are also not found on the homepage. Just a grey antique background with some fun details and online casino mascot are depicted. It has a typical theme; A tad of old-fashioned, but in a whole new jacket. Immediately it becomes clear what you can expect for a welcome bonus on registration and deposit. It is also clearly pictured where you are able to enjoy playing in this online casino. This online casino is so innovative that it has a scroll page, which in a fun way shows the various benefits and opportunities of the casino. Lenny leads you as a true host, giving you a line of advice to take along while playing in the online casino. In addition, a small link has been added on the homepage, of a video that tells you about Lenny. As previously described, SuperLenny Live Casino has a tremendous simplicity and works with calm earth tones. In this way, the online casino ensures that everything is easy to find and you do not have to worry about finding what you need. At the top of the page is a small, clear menu. Here you have the choice of casino, live casino, sports, live sports and you can easily go to the promotion page. In the other corner of the menu there are some things that are relevant to you as a player. Here you can make deposits, see your balance, update your account information, and receive messages. If you need help and you want a quick response, there is the live chat. This is shown in the bottom corner of the screen, remarkable enough. When you click here you can select a language and leave your information there. It also shows that it is a specialised customer service. You can fill in the digital form with which department you want to speak. Then you can have a conversation with one of the employees. Visit Live Casino straight away! At the top of the homepage is a very clear link shown to live at the live casino. Simply enough, you will immediately see an overview of all available games and tables. If you click on one of the images with your mouse, you will be able to select the game details option. Then a small pop-up screen will appear that will allow you to play without money. The idea of this is that you can try it out free of charge without having to put in direct money. Also, in the overview of most tables, there are indications as to which bet limits are set. 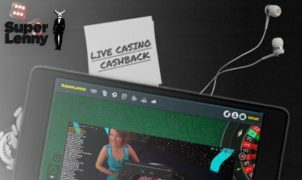 SuperLenny Live Casino uses the well-known Evolution Gaming, among others, as the software developer for the live casino. In addition, they have recently expanded with NetEnt Live. SuperLenny offers several Blackjack games, Live Roulette, Live Baccarat, Live Poker. In addition, there are several variants and VIP tables. Selecting one of the live games will bring you to the live casino of Evolution Gaming or NetEnt. The gaming tables of Evolution Gaming are almost always professional green, and the walls are usually green with dark brown details. The big disadvantage of Evolution Gaming’s live casino is that there are always several live dealers around your table. This regularly causes the necessary distraction due to the background noise that this causes. If you choose Live Blackjack, this will be slightly less. If you decide to play a VIP variant, the environment is just a bit more generous and the noise is also less. At NetEnt Live you are less affected by this. You always play a separate space and the image quality is in HD. Female and male live dealers will alternate in the live casino. It does not matter, however, that you will receive most of the time by a woman. In all cases, the live dealers speak English. For some, this will be more flawed than with others. During live roulette, the female live dealers are often dressed in a gold or blue dress, depending on the variant. During live blackjack this will often be a black dress. The live dealers often try to show interest in their players in a funny way. Some of them are better than others, but the intention is certain. Of course, it’s possible with SuperLenny to play live roulette. The number of available tables is certainly not scarce, but scarce than the offer of blackjack tables. The different tables also have different limited bet limits. Very positive to Evolution Gaming’s live roulette is that during the game, the screen is often changed between different perspectives. For example, you may see the roulette wheel when the ball rolls in, and you get other moments to see the dealer. For example, try to play European Roulette. Here you will enjoy such an optimal experience. There are also Auto Roulette variants, there is Turkish Roulette, you can play VIP roulette and there is a London roulette variant. Play the VIP variant of Live Roulette at NetEnt, then you will play in a virtual ballroom. If you already have a lot of choice from roulette variants, you have not seen the live blackjack tables at SuperLenny. The live blackjack tables are often a bit easier, but have different levels of commitment. There are variants A through I available from the regular tables, and if you go for a VIP variant, you can choose from A to G. And then we have not even heard about NetEnt’s Live Blackjack tables. You can also make use of other live casino promotions, such as the Live Casino Cashback promotion, where you can receive 10% cash back when you play live casino in the weekend. The playing quality of the live casino depends in this case very much on the software provider. As you know now, we are dealing with the live casino of Evolution Gaming and NetEnt. Evolution Gaming features a live casino in which multiple tables are often very close to each other. This causes the necessary background noise and can sometimes be disturbing while playing. Previously, the image quality was often moderate, but this has been a lot improved. 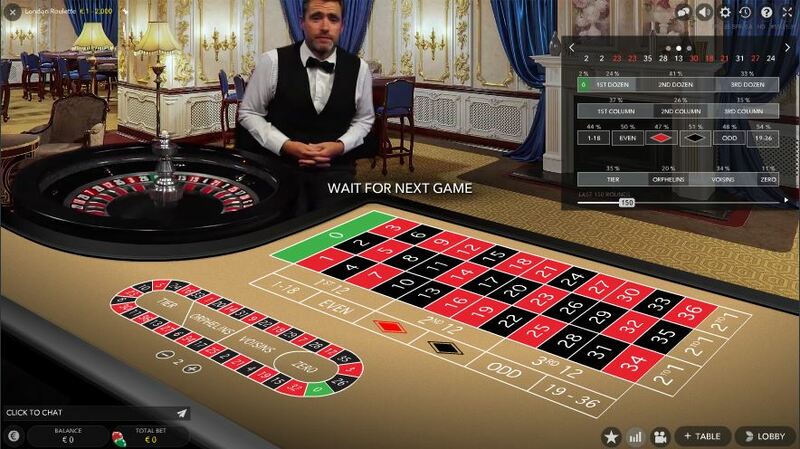 The 3D aspect given to live roulette has already made a very big step in the right direction. In addition, NetEnt is also a major professional provider. The offer of games is a bit smaller, but the HD picture quality and the quiet environment are definitely a plus. If you have any doubts about the security of this casino, take a look at the bottom of the page. Here you will find that SuperLenny has an MGA license among others. MGA stands for the Maltese Gaming Authority, and is one of the strictest worldwide casino certificates. SuperLenny walks a different path than its competitors. Of course, this online casino also has the overall online casino gaming capabilities. In addition, SuperLenny has chosen a deviant but innovative idea, namely; Live Sports. Although this is not very different from other sports bets, you can bet here on upcoming matches. For both hockey, tennis, handball and football there is a category. You can track the intermediate stages while the match is in progress. If you are looking for some classics, there are always the final games and classic table games. The fact SuperLenny has a professional live chat is clear, but that’s not the only way you can come into contact with the casino. During opening hours, from 10 a.m. till midnight, it is possible to chat, call and email with the casino. The information you need is available on the website. Paying at SuperLenny can be done in several ways. You can choose from iDeal, Visa, Mastercard, Neteller, Paysafecard and Skrill payments. Some mobile casinos are available as an Android or iPhone casino app, while others have focused on providing a mobile version of their online casino site. SuperLenny implemented the latter. This means that there is no need to download anything. You simply open our casino page from your mobile device and automatically get redirected to our mobile casino. Most of the promotion campaigns are valid both online and on mobile. 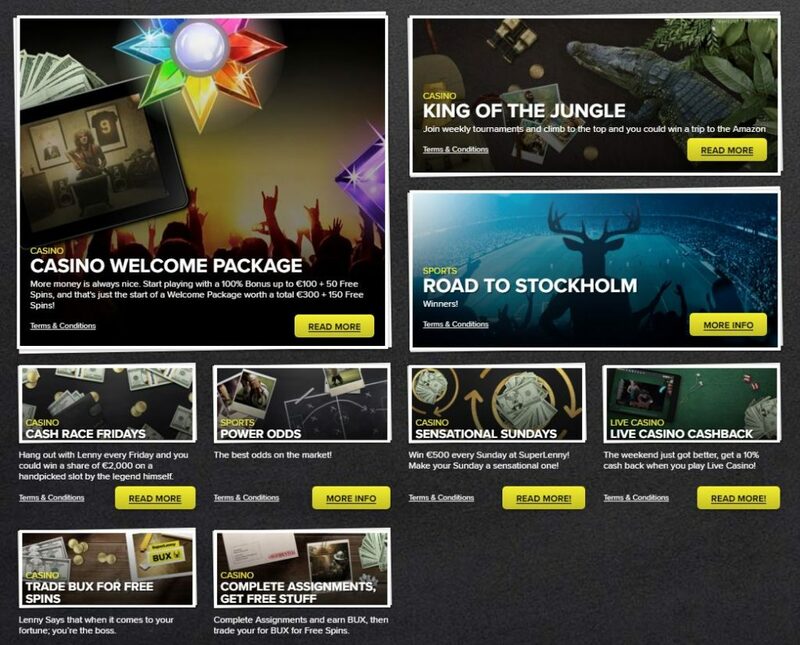 Some of the casino promotions are tailored specifically for the mobile customers. No need to download means that you can enjoy the casino in a discreet way. SuperLenny’s goal is to provide you with the same casino experience no matter the method you use for accessing the casino site. So what do you need to do to enter the mobile world of SuperLenny Casino and starting enjoying their mobile casino? Open up your mobile browser on iPhone, iPad or Android and type in our URL. Sign in if you already have an account at SuperLenny or sign up directly from your mobile or tablet and receive a Welcome Package with bonuses and free spins on your first deposits. Use your bonuses for playing mobile casino without any download. You can switch between mobile and computer at any time. Your account will get updated in real time no matter what device you are using to play our games. 10:00 – 0:00 CET Live Chat, Telephone support, 24/7 Email & VIP support. Credit Cards, Debit Cards, Wire Transfer, NETELLER, Skrill, Paysafecard, Euteller, Trustly, iDEAL, Sofort, InstaDebit, PugglePay.